Of it (or likes of me) . . .
It’s the way I feel when I look at Eric Kellerman’s images of striped light colliding with dark torsos, scapulas, and the dunes of the mons veneris. The eyes (mine, at least) respond in kind—unbolted, loosed from all sense of origin, cause, effect. A complimentary esteem. To the tenebrisms: my regards. These photos form part of an ongoing series called Tenebrisms. The word “tenebrism” (deriving from the Latin for “darkness”) usually refers to a style of painting associated with Caravaggio and others, where deep shadow prevails and strong contrast is used to heighten the drama of the subject matter. However, my tenebrisms are far from dramatic; on the contrary, they are rather quiet, reflective things. No Judith beheading Holofernes here. Like one or two other photographic styles I have evolved, the first tenebrism came about accidentally. 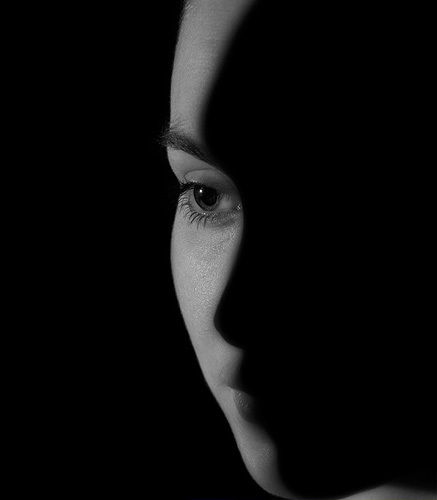 The stripe of light, created by the flash of a snooted studio lamp through a narrow gap between two abutting boards onto a woman’s angled face, cast an interesting shadow—one that, following the contours of forehead, nose and chin, appeared to be the profile of another dark face superimposed. I call this photo Eclipse, for reasons obvious when you see it! The stripes my studio lamps and abutting boards generate are not as a rule smooth bands of undifferentiated light—for one thing, their passage through the narrow gap also endows them with interference patterns in the form of alternating substripes, both lighter and darker. These add variety and texture to the image. But best of all is the unpredictable journey undertaken by the stripe as it encounters the contours of a complex volume like the female body. Anatomical discontinuities are brought together by highways of sinuous light adjusting their routes, widths and intensities according to the terrain traversed. This is where the precision work begins, a choreography of muscle, bone, sinew and skin. Every small move, a single breath, a twitch, can make or break a photo. Serendipity beats meticulous planning any day . . .
Kellerman’s The Box was one of 2015’s “books of the year,” awarded by the Federation of European Photographers. See more from Kellerman on Facebook and check out his most recent book from Edition Galerie Vevais!